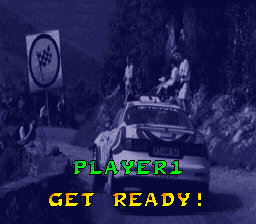 This is a prototype of Rally: The Final Round of the World Rally Championship, an unreleased game by JVC. 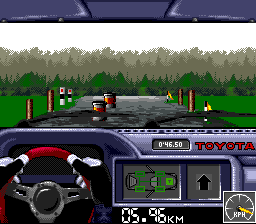 Rally (the official title for the US release) is a first-person racing game, with a view from the center of the interior of the car. You have to avoid bales and signs, swinging wildly from side to side. The game looks very much like it is complete, although the difficulty level is really high since you do not have a lot of time to react to obstacles. There are a total of 12 courses, with a championship mode that combines them all. There are official car brands in this game, so you can choose from manufacturers like Ford and Toyota. 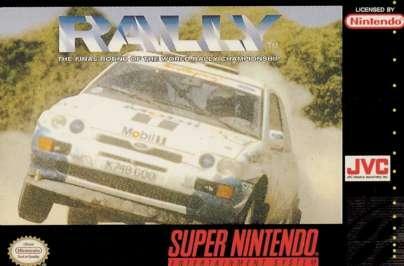 This game is endorsed by the RAC Rally, a major rally race in the United Kingdom. 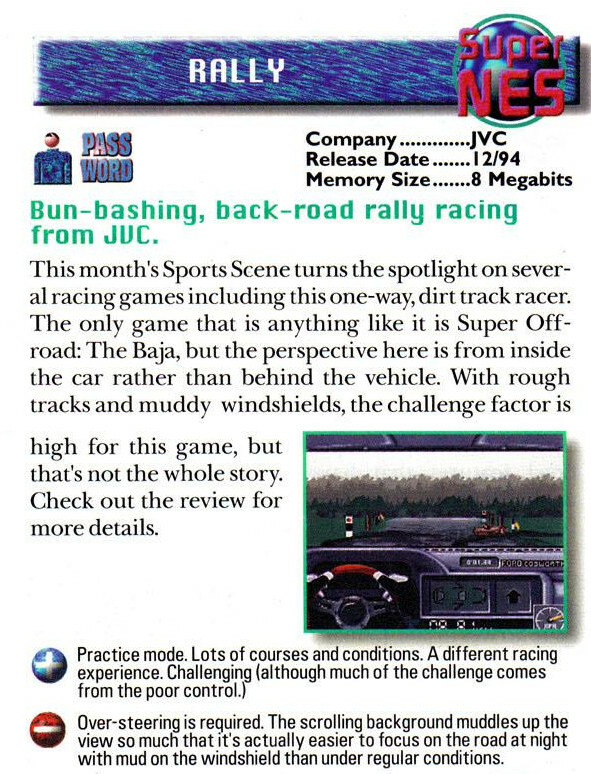 For sponsorship reasons, it was called the Network Q Rally when this game was made (Network Q is a used car dealership network in the UK). 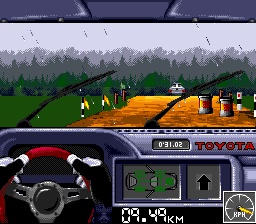 There was a DOS game of the same name, with the same layout for courses, but the game is completely different (it is a 3D, behind-the-car racer). 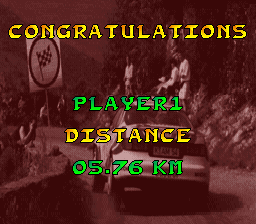 Despite being officially licensed by the Network Q Rally, the courses are not based on real world courses. 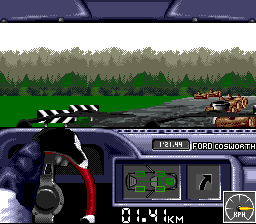 Getting ready Driving a Ford by some logs. Going the distance Toyota, by some barrels. 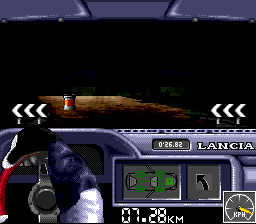 There doesn't appear to be any visual changes to the interior of the car. If it is raining, the windshield wipers are on, which is distracting. 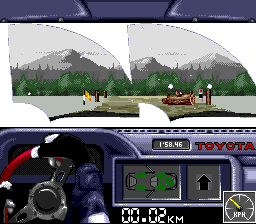 There is even snowy conditions, just to make the field of view even less. 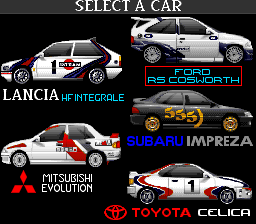 Select from 5 car manufacturers Night time racing. The ROM image of this game was leaked by the scene group SNK on May 4, 1995. Unfortunately I could not find the original scene files, so it is not possible to confirm that the ROM image is clean. Nintendo Power covered this game in February 1995. They absolutely savaged this game for its poor controls.